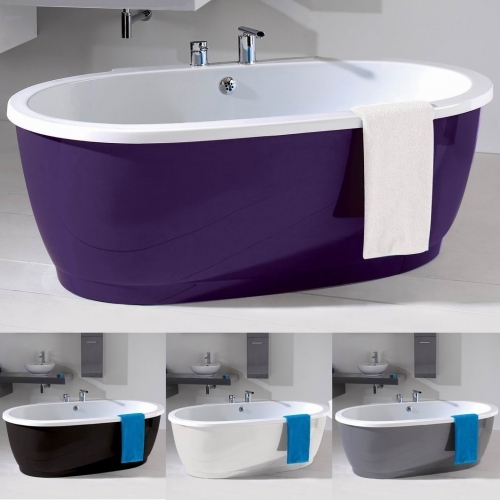 Freestanding baths can make a superb statement in any bathroom. Have you ever walked into a bathroom for the first time and thought “wow”? This may be because the bathroom has been perfectly designed or it may be the elegance of the freestanding bath which stands before you. The placement of freestanding baths is what can make or break a room, you need to work out your bathroom layout. For spacious bathrooms these baths can look absolutely spectacular when placed in the centre of the bathroom, not only making a statement but becoming the centre piece of the bathroom that you can work around. For the smaller bathroom, you can still enjoy the freedom of a freestanding bath by placing it against the wall. Believe me they look great under a large bathroom window as the light flows into the space. If you have your heart set on freestanding baths, then it’s advisable to take control of your layout. Work out what the bathroom size is that you have to work with and measure up the baths available, this will give you an idea on where you can place it and how much space you have to fit your other essential items. Once you have measured the space you have available you can now sit down and plan out your bathroom. The layout is an essential step in any bathroom design especially when you intend placing a freestanding bath in the centre of the room. Measure all the space you will have free around the bath and you can then work in your other items. Remember if you intend placing a vanity unit in the bathroom, ensure that the doors will not be obstructed and that you can move around with ease. The advantage with freestanding baths is the selection of designs they are available in, this means you can find one to suit any bathroom décor. From the white oblong design to the black square design, you are definitely not restricted when it comes to choice. I personally prefer white only because it always keeps a bathroom looking spacious and crisp. But if you really want to make a statement and add colour to your bathroom, then the black colour also works exceptionally well. I would suggest you keep the darker colours for the spacious bathrooms, in a wide space they will not make your bathroom feel compact.